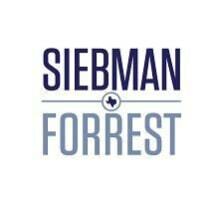 Siebman, Forrest, Burg & Smith, LLP is a full service litigation firm with an emphasis on litigation in the U.S. District Court for the Eastern District of Texas, and the state courts of Collin, Cooke, Denton, Fannin, Grayson and Harrison Counties. The firm is regularly engaged in litigation in other forums throughout the State of Texas. It is committed to continuing professional development and service to the bench and bar of North and East Texas, and keeps abreast of technological and legal developments in serving its clients. The firm takes pride in aggressively representing the legal interests of its clients while keeping in sharp focus their economic goals and objectives.